The arts and artists of Maine. Twenty-eight artists have been selected from 900 entries for the Portland Museum 2013 Biennial. 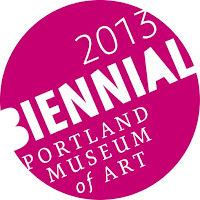 The exhibition is the PMA’s eighth consecutive biennial and is curated by Jessica May, Curator of Contemporary and Modern Art; it will be on view at the PMA October 3, 2013 through January 5, 2014. The 2013 PMA Biennial is following a slightly different process than in the past because the selection process was conducted internally, rather than by a panel of independent jurors. The goal of the exhibition is to explore one very strong, deep thread of contemporary practice that has relevance both regionally and nationally. Many of the artists in the 2013 PMA Biennial live in Maine for all or part of the year, but for others, the state has been an important part of their biography or artistic practice. The 2013 Portland Museum of Art Biennial: Piece Work will be accompanied by a solo exhibition in the PMA’s Circa series, Amy Stacey Curtis: 9 walks. For this exhibition, the museum will show three existing video works from Curtis’s oeuvre along with six new works, all using the theme of a walk near the artist’s home.